Bottom Line: Image Stabilization is useful, and the swivel LCD is convenient. A stylish design and 10x USM lens make for a great family camera. However, noise at high shutter speeds and at ISO 400, plus some focusing issues keep the S1 from reaching its full potential. Thank you to Newegg.com for providing us with the review product. 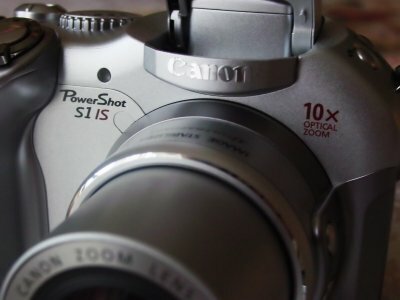 When Canon finally released the PowerShot S1 IS (image stabilization) earlier this year, the words "it is about time" were no doubt coursing through the minds of IS fans. Since 1995, when the first Canon IS lens was developed, Canon has been concentrating its IS technology exclusively on lenses (with the exception of a long-discontinued 2.6mp camera from 2001) for professional photographers. So it was a pleasant surprise when Canon announced the development of a new consumer-grade PowerShot that would carry the IS technology. Enter the PowerShot S1 IS. Geared towards the Upper-middle consumer market, the S1 boasts a variety of features including a 10x optical zoom, a variable-angle LCD, and of course, Canon�s optical image stabilizer. However, with only 3.2 effective megapixels, the S1 falls behind in raw image recording power when compared other, more powerful cameras in its price range. Do the S1�s features and IS capabilities make up for the lack in megapixels? Read on to find out.